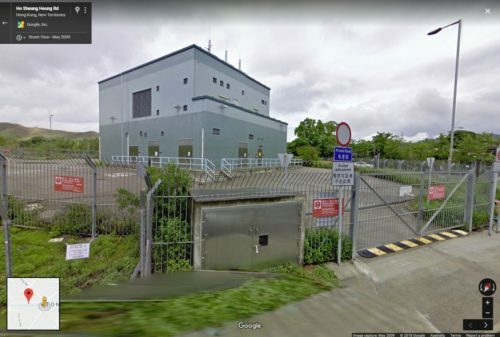 Since the 1970s the Mass Transit Railway network has expanded to cover much of Hong Kong, but at Kwu Tung in the northern New Territories there is something different – a ghost station that has no trains stopping at it. 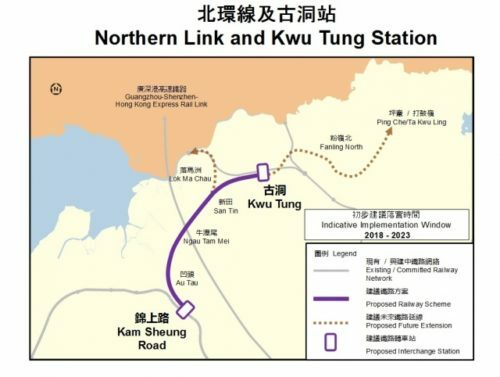 Named Kwu Tung (Chinese: 古洞站) the station was built as part of the Lok Ma Chau spur line project of the early 2000s, which extended the East Rail Line via a mix of tunnel and viaducts to an additional border crossing at Lok Ma Chau. 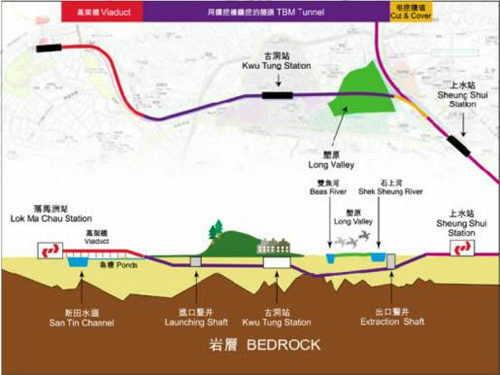 As part of this project it was decided to build provision for a future station at the midpoint of the tunnel, to serve the Kwu Tung New Development Area. This required some additional engineering works while building the tunnel. A box for the future Kwu Tung station will be constructed using diaphragm walls excavated to rock head. The box may be excavated before the TBM passes through, or after the TBM has passed through, in which case the precast lining units will be removed during excavation. Bored piles will be driven concurrent with the diaphragm wall to provide the basis for the future station construction. Break out and break in ground treatment will be required to enable the TBM to enter and exit the station box safely and without wall collapse. Even if the TBM drives through the area before excavation on the first drive, it is likely to pass through an excavated box of the second drive. A temporary floor slab will be required to be constructed below the level of the second TBM drive and it will need to incorporate a suitable ‘bedding” on which the TBM can pass over. With the station box requiring additional support during the construction process. Before the roof was built over the top, and grass planted. 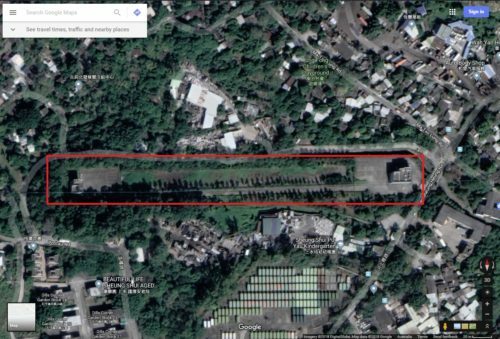 Today two buildings mark the site – “Emergency Passage No. 3 and No. 4” – providing ventilation and emergency exits to the tunnel below. 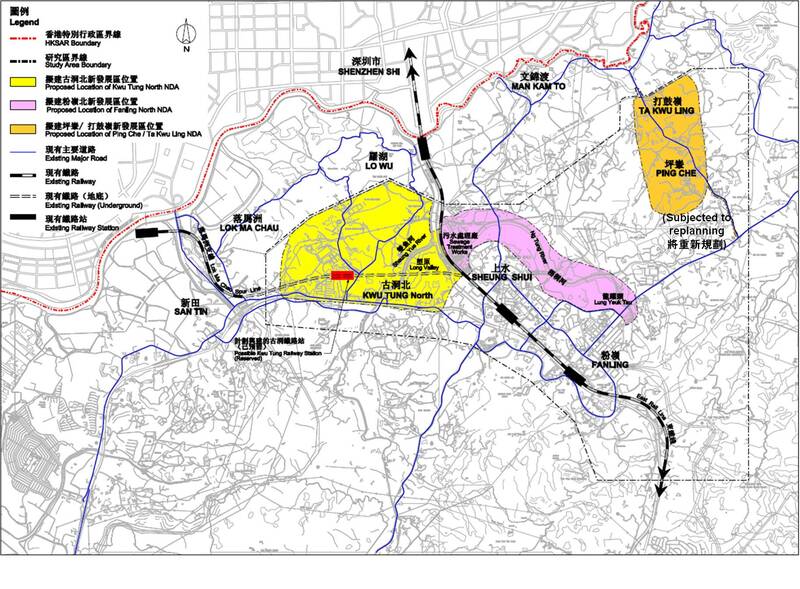 The Hong Kong government’s Railway Development Strategy 2014 includes the Northern Link and Kwu Tung Station as a future expansion of the rail system. The Northern Link will be a railway line between the Kam Sheung Road Station on the existing West Rail Line and a new station at Kwu Tung on the Lok Ma Chau Spur Line. 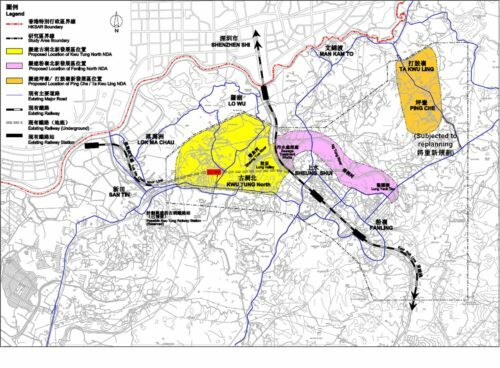 The Northern Link will have a route length of about 10.7 km, and provide shuttle service between the two terminal stations (i.e. Kam Sheung Road Station and Kwu Tung Station). Construction of the Northern Link was expected to commenced in 2018 with the line opening in 2023, but no progress has been made so far. More photos of Kwu Tung station under construction can be found at the Hong Kong Place website. This entry was posted in Transport and tagged abandoned, construction, ghost stations, KCR, Kowloon Canton Railway, Mass Transit Railway, underground. Bookmark the permalink.